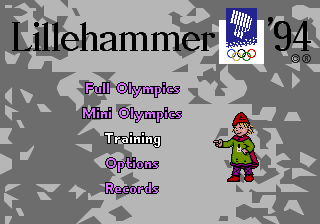 Winter Olympics (ウィンターオリンピック) or Winter Olympics: Lillehammer '94 and known as Winter Olympic Games in North America, is a Sega Mega Drive, Sega Master System and Sega Game Gear sports game that ties in with the 1994 Winter Olympic Games held at Lillehammer, Norway. Main article: Winter Olympics/Magazine articles. Main article: Winter Olympics/Promotional material.